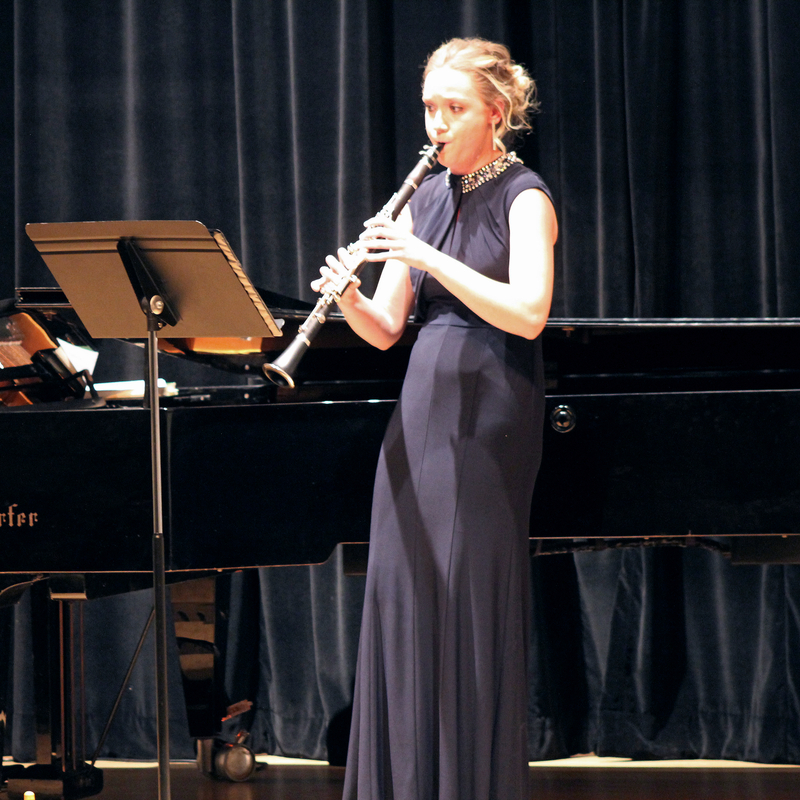 A clarinetist from Manitoba is the winner of the 14th annual Verna Mae Janzen Music Competition at Canadian Mennonite University (CMU). Stephanie Wilson's performance earned her first place and the $700 prize that comes with it on Wednesday, March 20. She is the first clarinetist to ever win the competition. "Being the first clarinetist to ever win has been a surreal experience," says Wilson, who grew up in Winnipeg. "As exciting as it was to win, the real honour has been bringing new life to the competition through introducing a new instrument. I think it's a super exciting time for CMU as more and more students participate on different instruments and audiences become more interested in seeing a variety of instruments perform." Wilson has been playing the clarinet for ten years. She is in her second year of a music degree, with which she hopes to teach high school band. This was her first year participating in the competition. Nathan Dyck, a baritone in his third year of a Bachelor of Music in Vocal Performance, placed second and received $500. Third place and its $300 prize went to pianist Madeleine Friesen, who is in her fourth year of a Bachelor of Music with concentrations in Music Education and Musicology. Riley Dyck (piano), Annabelle Hollander (soprano), Emily Rempel (piano), Katy Unruh (soprano), and Lisa Vuignier (soprano) also competed in the finals, advancing from an initial group of 11 competitors. "I think what's special about this music competition is the unending support of everyone around us," Wilson says. "Everyone from the audience members to our professors to our peers are so supportive of us as we work towards something big, which gave me the confidence to do my best." Matt Pauls, Assistant Professor of Music at CMU, says the competition gives students a goal to work towards, which is important when trying to master an instrument. "Goals help motivate you as a musician, and focus the work you do with your studio teacher and in the practice room." "It's a refreshing experience to get out of the practice room, get dressed up for a night, and play for an audience," says Wilson. "The competition gives us a chance to push ourselves while still being in a loving and supportive environment." Irmgard Baerg, Professor Emeritus of CMU and a celebrated pianist who has performed across Canada and internationally, and Terry Mierau, an alumnus of CMBC, one of CMU's predecessor colleges, and a former opera singer who has performed all over Europe, served as adjudicators for the finals. The competition is made possible by the generous donations of Peter Janzen of Deep River, ON. The event is named in memory of his wife, Verna Mae, who died of cancer in 1989 at age 53. "Without Peter Janzen's generous support, students would not have the opportunity to compete in an event like this," says Pauls. "His support gives students added incentive to work hard and encourages them to develop their musical potential to the best of their abilities." For Janzen, sponsoring the event is a way to contribute toward the success of CMU. He wanted to support CMU via a music competition because he and Verna met through their interest in choral singing. "I always dreamed of someday dedicating a memorial to my wife—a wonderful, loving, sensitive, intelligent, and happy companion," Janzen said in 2007. "Through the Verna Mae Janzen Music Competition at CMU, I can keep her memory alive." A Christian university in the Anabaptist tradition, CMU's Shaftesbury campus offers undergraduate degrees in arts, business, humanities, music, sciences, and social sciences, and graduate degrees in Theology and Ministry, Business Administration, Peacebuilding and Collaborative Development. CMU has 1,600 students, including those enrolled in degree programs at its Shaftesbury Campus and Menno Simons College Campus. CMU is a member of Universities Canada. For information about CMU, visit cmu.ca.